Two dusty discoveries may shake up our understanding of the inner solar system. Mercury shares its supertight orbit with a big ring of wandering dust, a recent study suggests. And a cloud of as-yet-undiscovered asteroids likely gave rise to a similar halo in Venus' neighborhood, another new paper concludes. "It's not every day you get to discover something new in the inner solar system," Marc Kuchner, a co-author of the Venus study and an astrophysicist at NASA's Goddard Space Flight Center in Greenbelt, Maryland, said in a statement. "This is right in our neighborhood." 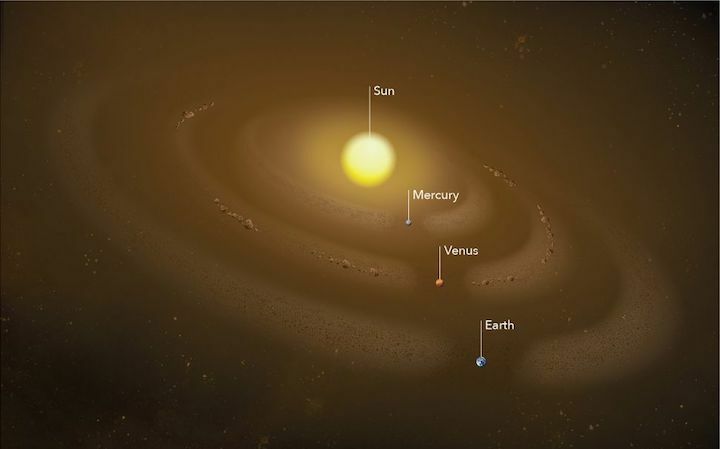 Both Earth and Venus have collected co-orbiting dust rings, as the planets have shepherded the particles with powerful gravitational tugs. Mercury's path, however, was thought to be free of such a feature. "People thought that Mercury, unlike Earth or Venus, is too small and too close to the sun to capture a dust ring," Guillermo Stenborg, a solar scientist at the Naval Research Laboratory in Washington, D.C., said in the same statement. "They expected that the solar wind and magnetic forces from the sun would blow any excess dust at Mercury's orbit away." But Stenborg and his colleagues shattered that expectation. The researchers analyzed images captured by one of NASA's twin Solar and Terrestrial Relations Observatory (STEREO) spacecraft, both of which launched into orbit around the sun in 2006. The researchers created a model based on these photos in an attempt to "edit out" dust that could make it more difficult to understand the data gathered by STEREO, NASA's recently launched Parker Solar Probe and other sun-studying craft. When they applied the model to the STEREO imagery, the astronomers saw dust — a lot more of it than they anticipated. "It wasn't an isolated thing," co-author Russell Howard, also a solar scientist at the Naval Research Laboratory, said in the same statement. "All around the sun, regardless of the spacecraft's position, we could see the same 5 percent increase in dust brightness, or density. That said something was there, and it's something that extends all around the sun." The team calculated that the dust ring is about 9.3 million miles (15 million kilometers) wide. The researchers reported their results last November in The Astrophysical Journal. The Mercury-orbit ring is quite a bit smaller than the halo that shares Venus' path, which, while just 6 million miles (10 million km) across, spans 16 million miles (26 million km) from top to bottom. But such dust rings are extremely diffuse. For example, Venus' co-orbiting halo is just 10 percent denser than the surrounding space, NASA officials said in the same statement. And if you packed all of that ring's dust together, you'd get an asteroid just 2 miles (3.2 km) across. 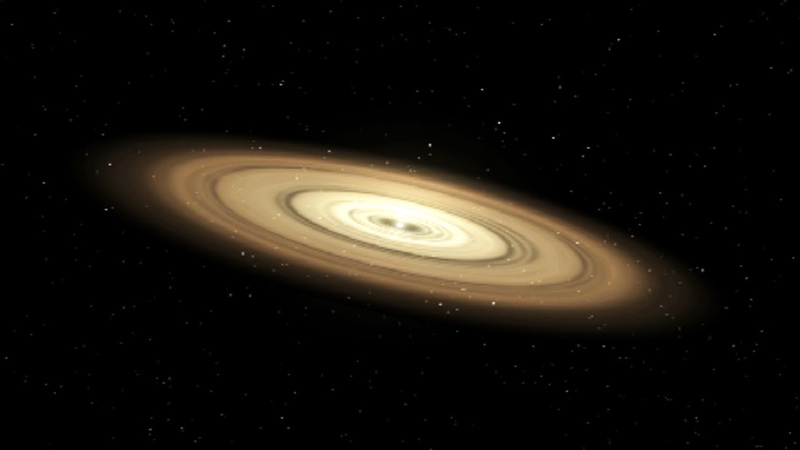 In the second paper, Kuchner and fellow NASA Goddard astrophysicist Petr Pokorný set out to understand where the dust in the Venus-orbit ring came from. The scientists modeled all of the potential dust sources they could think of — objects in the main asteroid belt between Mars and Jupiter (the chief source of Earth's co-orbiting ring), Oort Cloud comets, Jupiter-family comets and more. "But none of them worked," Kuchner said. "So, we started making up our own sources of dust." The researchers' simulations identified the probable culprit: a population of undiscovered asteroids zipping around the sun in Venus' path. "We thought we'd discovered this population of asteroids, but then had to prove it and show it works," Pokorný, the study's lead author, said in the same statement. "We got excited, but then you realize, 'Oh, there's so much work to do.'" So, the duo built another model, which followed 10,000 hypothetical Venus-orbit asteroids through 4.5 billion years of solar system history. In the simulation, about 800 of these space rocks survived to the present day, suggesting that such a population may indeed exist in the orbital path of Earth's sister planet. It wouldn't be shocking for this little asteroid colony to have evaded detection; for starters, nobody has really searched for such rocks before. And it's tough to spot asteroids interior to Earth's orbit, because they get lost in the sun's blinding glare, the researchers said. Still, if the Venus-neighborhood asteroid population exists, "we should be able to find it," Pokorný said. NASA's Hubble Space Telescope could potentially do the job, he added. Pokorný and Kuchner reported their results in a study published online today (March 12) in The Astrophysical Journal Letters. n this illustration, several dust rings circle the Sun. 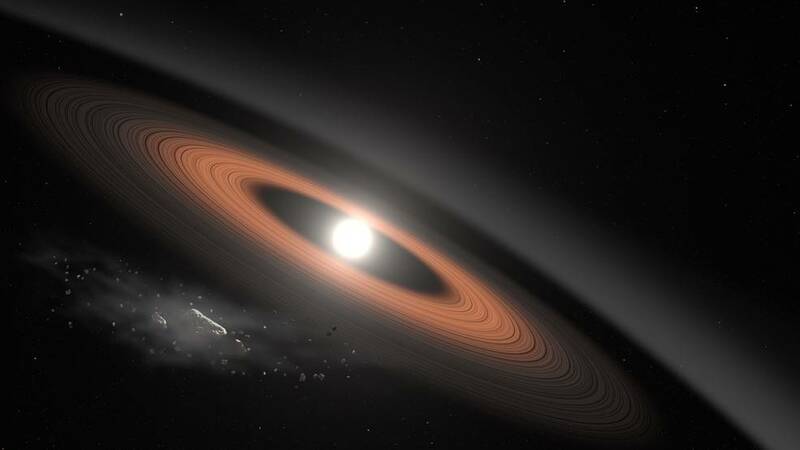 These rings form when planets’ gravities tug dust grains into orbit around the Sun. Recently, scientists have detected a dust ring at Mercury’s orbit. Others hypothesize the source of Venus’ dust ring is a group of never-before-detected co-orbital asteroids. Co-orbiting asteroids are an example of what’s called a resonance, an orbital pattern that locks different orbits together, depending on how their gravitational influences meet. Pokorny and Kuchner modeled many potential resonances: asteroids that circle the Sun twice for every three of Venus’ orbits, for example, or nine times for Venus’ ten, and one for one. Of all the possibilities, one group alone produced a realistic simulation of the Venus dust ring: a pack of asteroids that occupies Venus’ orbit, matching Venus’ trips around the Sun one for one. In this illustration, an asteroid breaks apart under the powerful gravity of LSPM J0207+3331, a white dwarf star located around 145 light-years away. 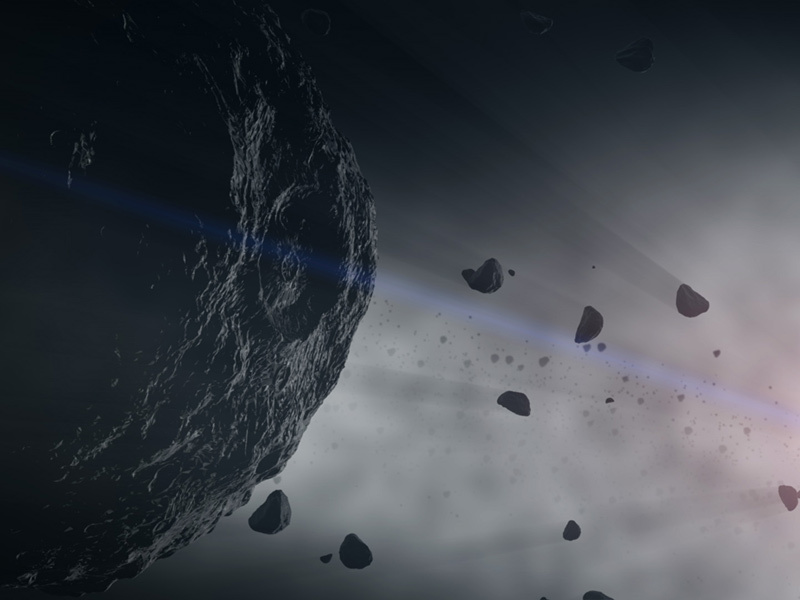 Scientists think crumbling asteroids supply the dust rings surrounding this old star.